When the German army marches into Caucasus, they bring with them theirs Muslim supporters to fire rebellions within Soviet Muslim peoples. That move made a great-worried within Soviet leadership. As Konstantin Oumansky, Soviet ambassador in Washington, said on one of the blackest days of the Black Summer of 1942: "I must said that I am a little worried about the Caucasus...The Tartars in the Crimea are, to a large extent, disloyal... they never liked us. It is well known that during the Crimean War they gladly 'collaborated', as we'd now say, with the English and the French. And, above all, there are religious factors, which the Germans have not failed to exploit. Nor do I trust the mountain peoples of the Caucasus. Like the Crimean Tartars, they are Muslims, and they still remember the Russian conquest of the Caucasus which ended not so very long ago - 1863." The same policy also applied in Kabardino-Balkhar area, although the Muslim Balkars were more outspokenly than the mostly non-Muslim Kabardinians. A national committee was formed under a local leader named Selim Shadov and has responsible to arrange the fields of religion, culture, and economy. The collaboration reached a highest-point during the Kurman ceremonies that held at Nalchik, the seat of the local administration of the Kabardino-Balkar area, on December 18. Again gifts were exchanged, with the local officials giving the Germans magnificent steeds and receiving in return Korans and captured weapons. An official from Reich Eastern Ministry named Bräutigam made a public address about lasting bonds of German friendship with the peoples of the Caucasus. Himmler decision to appointed SS-Standartenführer Harun-el-Raschid-Bey, an Austrian officer who converts to Islam, didn't made many good progression within the formation. In contrary, during his leadership the morals of the Turkestanis drop until a low ebb. Even a mutiny broke-up when on Christmas Eve 1944, 450 members of the 1st Battalion, led by Waffen-Obersturmführer Gulam Alimov and Waffen-Untersturmführer Asatpalvan, killed some NCOs and went over to the partisans. Himmler's reaction was fired Harun-el-Raschid-Bey and reorganized the formation, where the Azerbaijan contingents in the formation transferred to the Kaukasicher Waffen-Verbände der-SS. One of the oppositions came from Turkestani National Committee which longing independence of Turkestan. The committee that headed by Veli Kayum Khan, head of the Turkestani "government in exile", had been in charge of the political and national leadership of Turkestani volunteers. 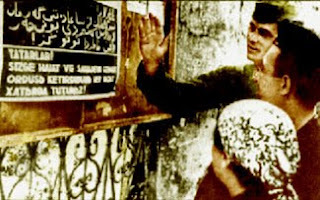 It had successfully raised the morale of the Turkestani volunteers by supporting independence for Turkestan and, with the aid of the Grand Mufti of Jerusalem and the SS-FHA, setting up schools at Dresden and Götingen to train religious imams for the Muslim military units in the Waffen SS and the Wehrmacht. His stand were supported by some Muslim leaders from Caucasus, like Kantimer, Alibegow, and Tschamalja. Sebastian Cwiklinski, Wolgatataren im Deutschland des Zweiten Weltkriegs: deutsche Ostpolitik und tatarischer Nationalismus. Schwarz, 2002. Iskander Giliazov, Legion "Idel-Ural" : predstaviteli narodov Povolzhia i Priuralia pod znamenami "tretego reikha". Tatarskoe knizhnoe izd-vo, 2005. N. Hidayat, Legiun Muslim Hitler. Nilia Pustaka, 2007. Joachim Hoffmann, Die Ostlegionen 1941 – 1943: Turkotartaren, Kaukasier und Wolgafinnen im deutschen Heer. Freiburg, 1976. Joachim Hoffmann, Kaukasien 1942/43 - Das deutsche Heer und die Orientvölker der Sowjetunion. Freiburg, 1991. Patrik von zur Mühlen, Zwischen Hakenkreuz und Sowjetstern. Droste Verlag, 1971. Antonio J. Munoz, Forgotten Legions: Obscure Combat Formations of the Waffen-SS. Axis Europa, 1991. Antonio J. Munoz, The East Came West: Muslim, Hindu, And Buddhist Volunteers In The German Armed Forces 1941-1945. Axis Europa, 2001. Bakhyt Sadykova, Istoriia Turkestanskogo legiona v dokumentakh. Kaĭnar, 2002. Nasiman Yakublu, Azerbaycan Legionerleri. Baku, 2006.